An employee uses an infrared camera to detect a gas leak at the Southern California Gas Company's Aliso Canyon storage facility near the Porter Ranch neighborhood of Los Angeles, Thursday, Jan. 12, 2017. Ohio has the most underground natural gas storage wells of any state and the highest number of those which might be vulnerable to leaks, according to a new study by researchers at Harvard University and Boston Children’s Hospital. Of Ohio’s 3,318 underground wells used for natural gas storage, 902 are repurposed wells. Those wells were initially drilled for something else, such as the extraction of oil and gas. That means they’re more likely to share age and design characteristics that contributed to the four-month methane leak at Aliso Canyon in California from 2015 to 2016, said Drew Michanowicz at the Harvard T.H. Chan School of Public Health. He is lead author of the study published Tuesday in Environmental Research Letters. Ohio has about two dozen active facilities that put natural gas into wells under pressure and take it out on an as-needed basis, compared to 47 in Pennsylvania and 44 in Michigan. Each facility can have dozens or hundreds of storage wells connected to it. “The primary function of gas storage is to meet peak demands of the winter heating season, especially for residential heating, and to balance the supply and demand on the system,” Dominion Energy Ohio spokesperson Tracy Oliver explained. Nonetheless, on a nationwide basis, “around half of the facilities have potentially obsolete wells that wouldn’t meet today’s standards for safety,” Michanowicz said. Those facilities raise concerns about potential risks to public health and the environment. 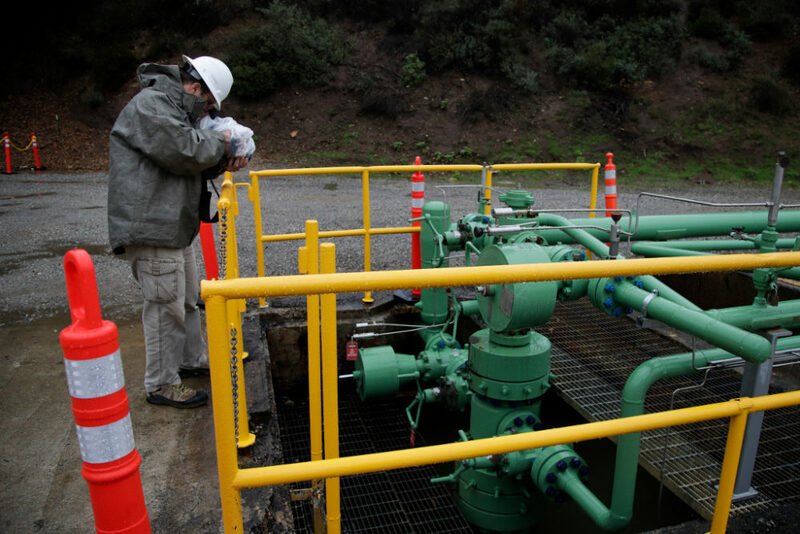 The Aliso Canyon leak that was the impetus for the new report spewed more than 97,000 metric tons of methane into the air over a four-month period, making it the largest such release in U.S. history. At its peak, the blowout basically doubled the methane emissions for the entire Los Angeles basin, researchers in Colorado and California reported in the journal Science last year. Over the four-month period of the leak, about 200 people a month reported headaches, nosebleeds, nausea and dizziness. Dozens of people were still reporting symptoms each month in late 2016. Aliso Canyon “was not the first facility to leak,” Michanowicz said, noting that about 200 other known releases have occurred nationwide. One example is a 2001 explosion from an underground storage facility in Kansas that killed two people. According to the National Institute of Environmental Health Sciences, health impacts from climate change include the spread of disease, changes in the quality and quantity of water, exacerbation of respiratory and cardiovascular diseases, and physical, social and psychological effects of more extreme weather events, such as droughts, hurricanes and flooding. One risk with repurposed wells is that they likely were not designed to store natural gas under high pressure, Michanowicz said. Ninety-nine percent of those wells were also constructed before 1979. That makes it likely that they have a single barrier to contain gas. At Aliso Canyon, there was “only one single steel pipe that separated the gas flow from the outer rock formation,” Michanowicz said. A federal task force report released in October 2016 found that a second barrier could have avoided the uncontrolled blowout at Aliso Canyon. “Except under limited circumstances, natural gas storage operators should phase out single-point-of-failure well designs,” the task force wrote. “We were trying to assess… whether those single barrier type wells exist across the country,” Michanowicz said. The answer was yes. Nationwide, the Harvard researchers identified 14,138 active underground storage wells, about a fifth of which predated the facility and were not originally designed for natural gas storage. Eighty-eight percent of those 2,715 repurposed wells are in Ohio, Michigan, Pennsylvania, New York and West Virginia, the group reported. Moreover, 88 percent of the country’s repurposed storage wells date to before 1960, so they would be more vulnerable to other defects as well, Michanowicz’s study noted. The PIPES Act signed by President Obama last June calls for minimum federal standards for underground natural gas storage tanks by June 2018, and an interim final rule was issued last December. It’s not yet clear whether the rule will be weakened by the Trump administration. Meanwhile, for underground storage facilities within Ohio, the Ohio Department of Natural Resources has authority to review maps and records and conduct visual inspections. But the primary responsibility for detecting and reporting leaks rests with the companies operating individual storage facilities. “Dominion has a variety of programs and methods to assess the integrity of its natural gas storage system, such as periodic testing for internal and external corrosion within the well casing, regular inspections of its storage wells to verify well integrity, and monitoring” by the company’s field personnel, Oliver said. The next step for Michanowitz and his colleagues will be a more detailed look at natural gas storage in individual states.